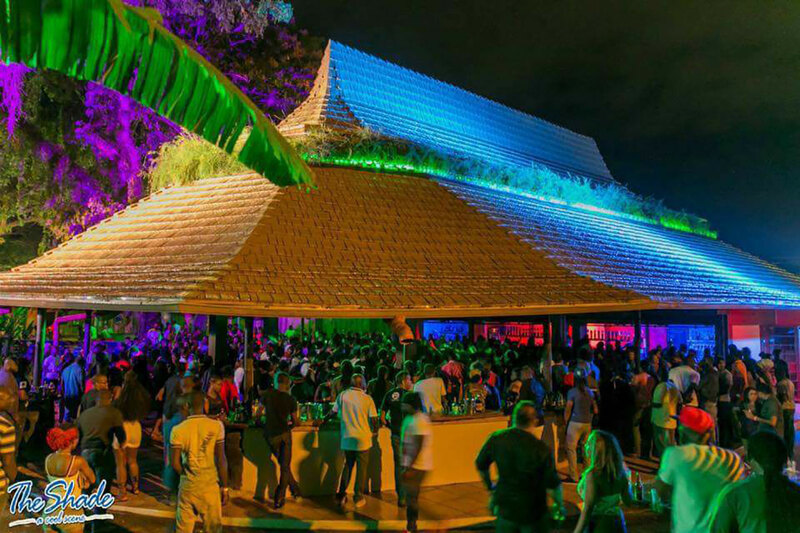 Tobago's vibe is so chilled that many visitors will be in bed by 10:30pm. 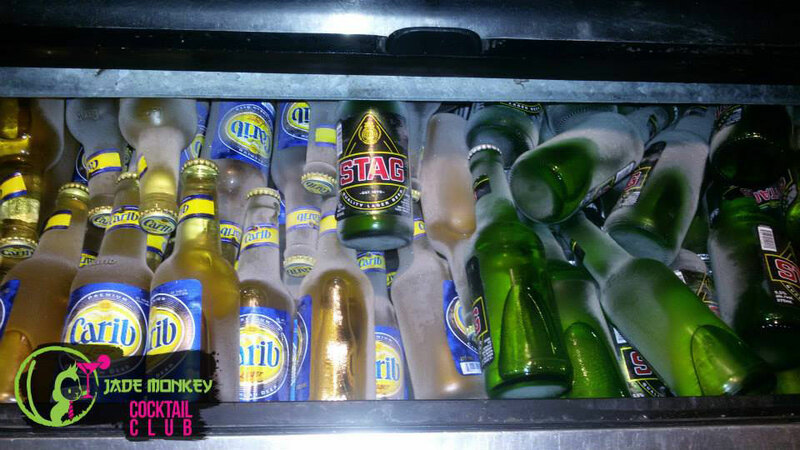 Don't make the mistake, however, of thinking that Tobagonians don't know how to have fun. 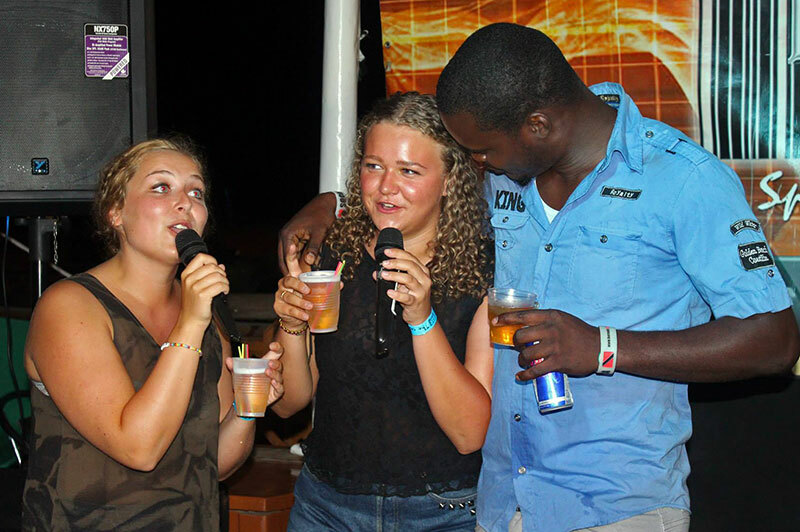 Having 'invented' calypso and soca, Trinbagonians almost believe that they invented partying. 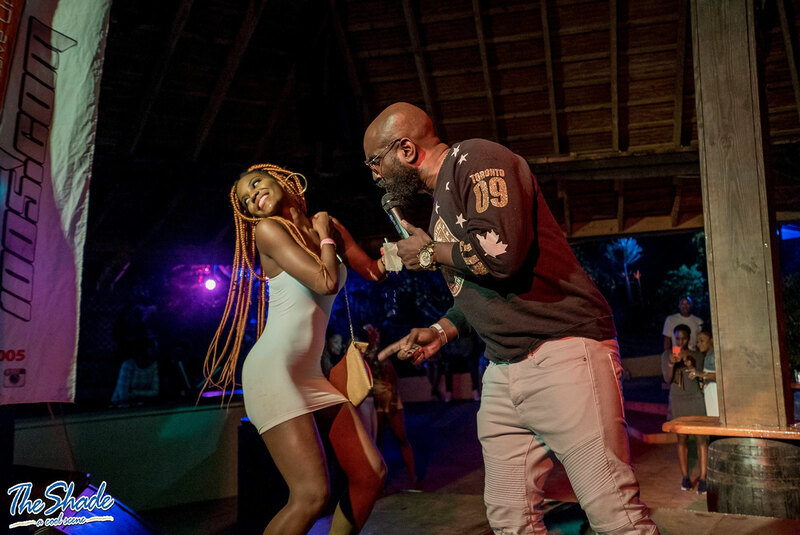 Most resort hotels provide live entertainment two or three evenings a week during the 'high season' months, but less often out of season. This will typically consist of a solo or duo vocalist, steel pan, or African drum and dance routine, normally of high quality. 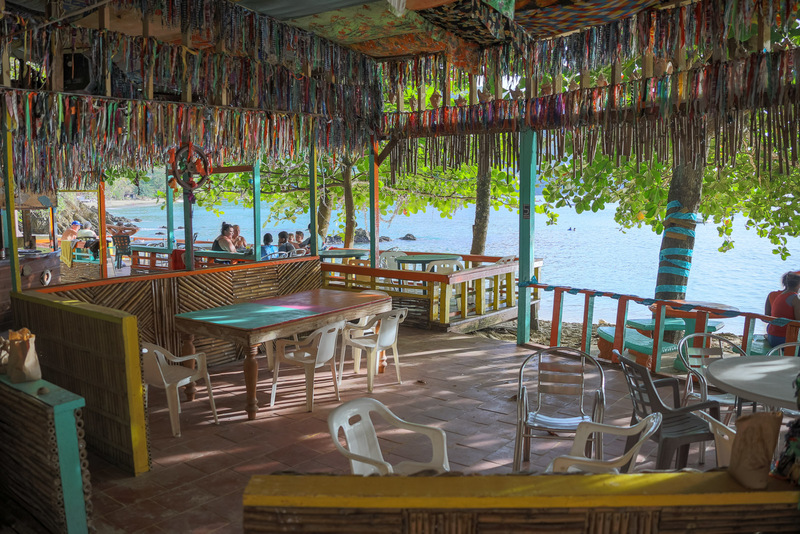 Away from the populated south-west of the island, visitors will find their evenings much quieter. 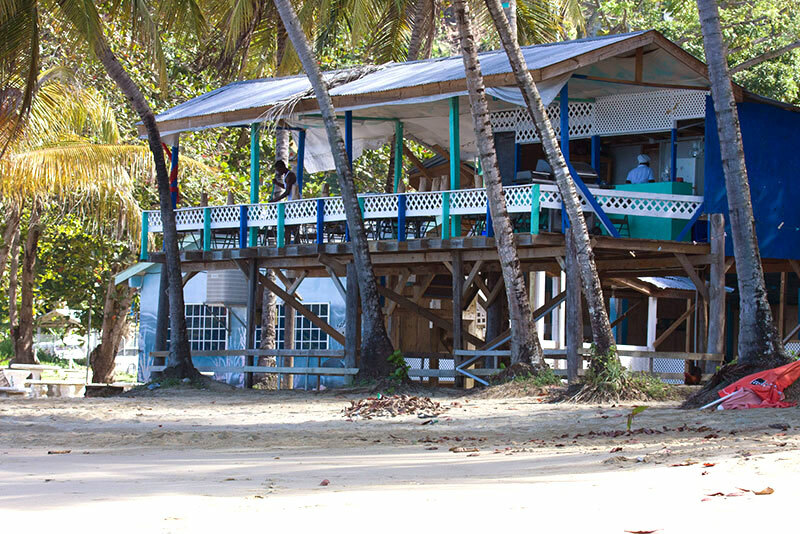 The one exception is Castara, where the local community makes active efforts to provide interesting entertainment for visitors and locals alike. 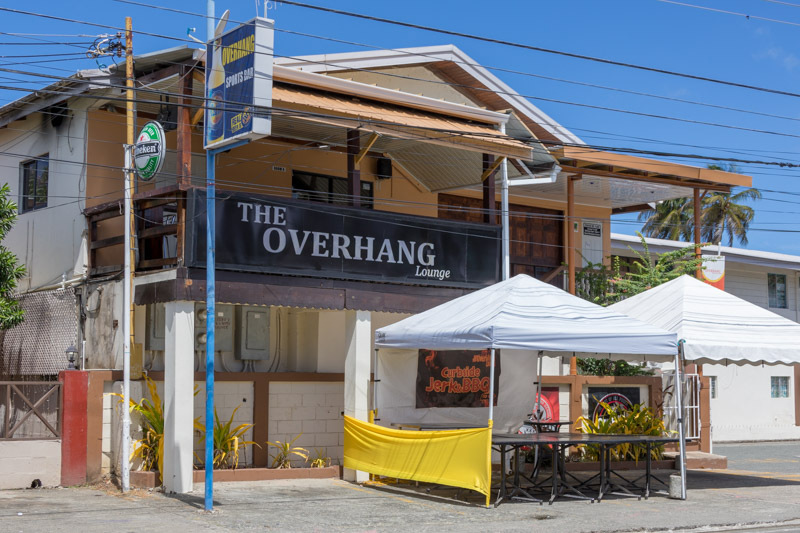 The following listings include a number of bars, restaurants, cafes, nightspots, clubs and casinos that have become popular "liming" spots, favoured by both the local business and expat community and by overseas visitors. The lists are presented in our perceived order of popularity of each venue. 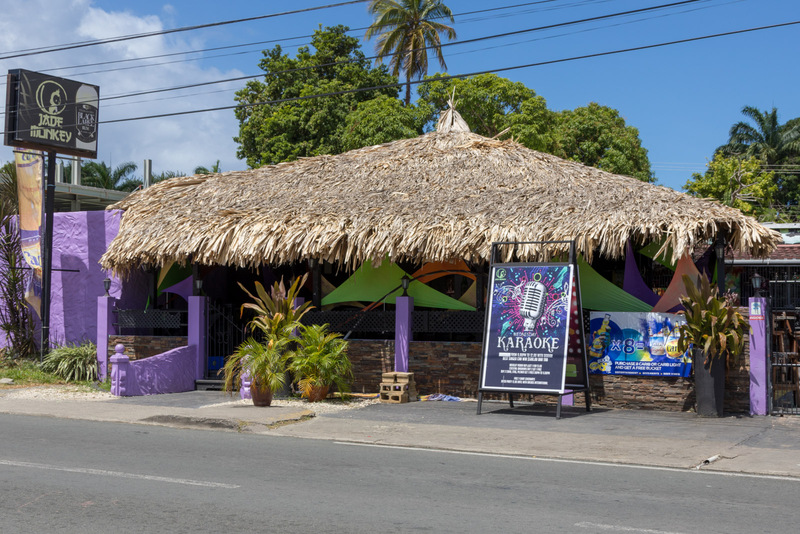 Located in Bon Accord, The Shade has become Tobago's premier nightclub, by a very considerable margin. 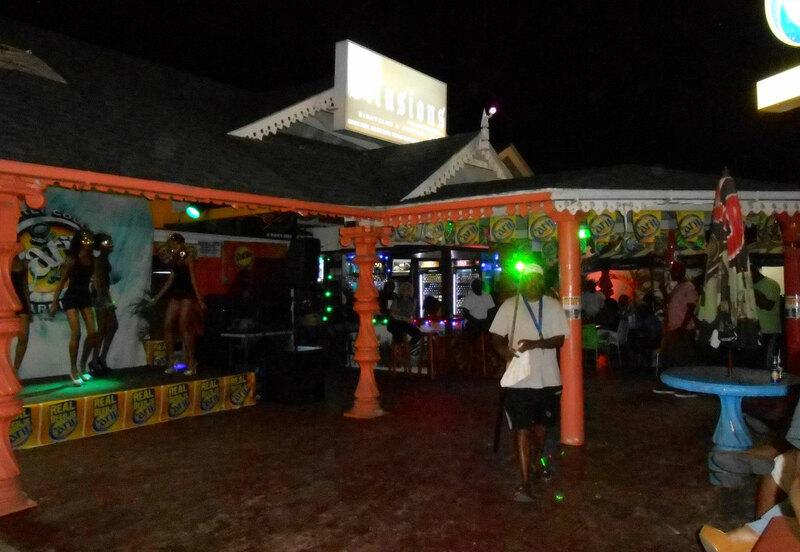 Friday and Saturday nights draw huge crowds to the open-air dance floor adjacent to the atmospheric thatched bar. 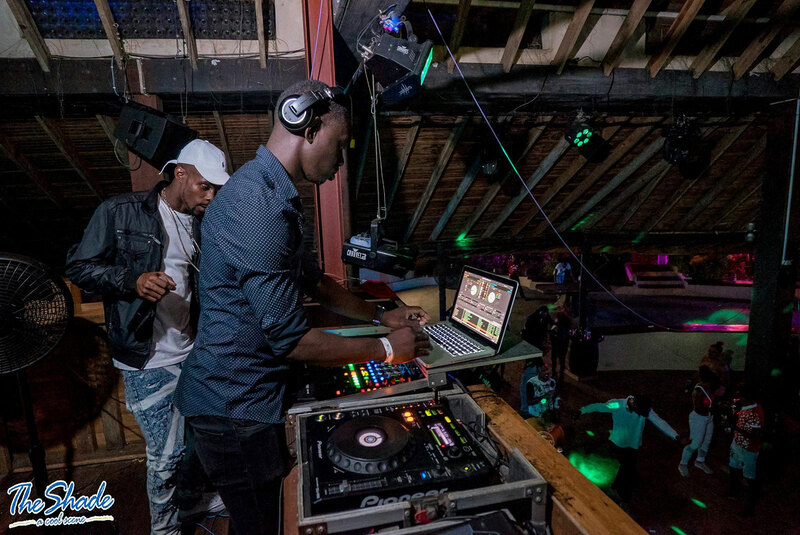 Dancing is the name of the game and the DJs play varied genres of music including soca, dancehall, hip hop, rock and reggae. Although the crowd will be mainly local and Trini, it is where all the young visitors on the island are to be found. Caution is advised and guests should not take fancy jewellery or other valuables. 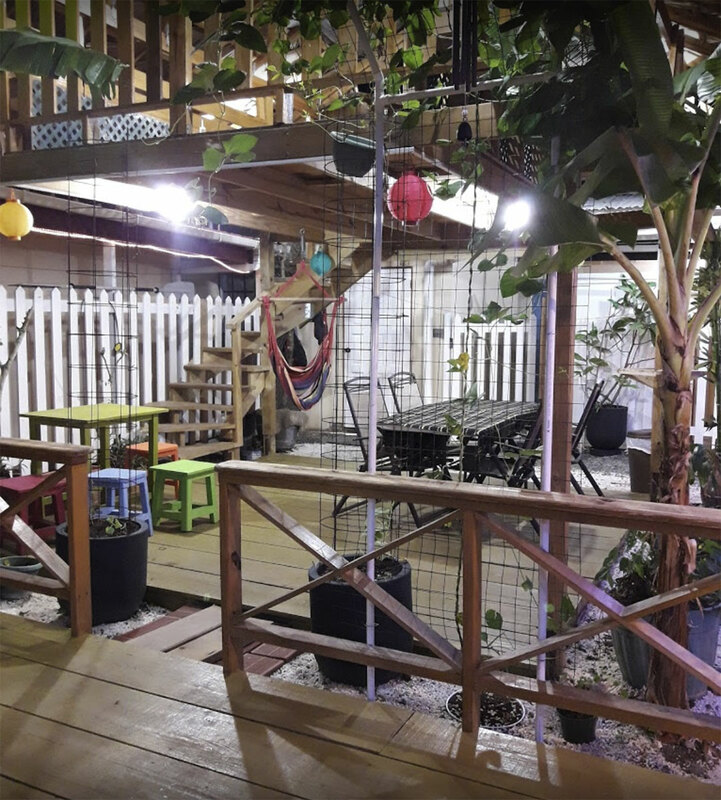 The Shade is open Wednesday, Thursday 5pm-10pm; Friday 5pm-6am; Saturday 10pm-6am. 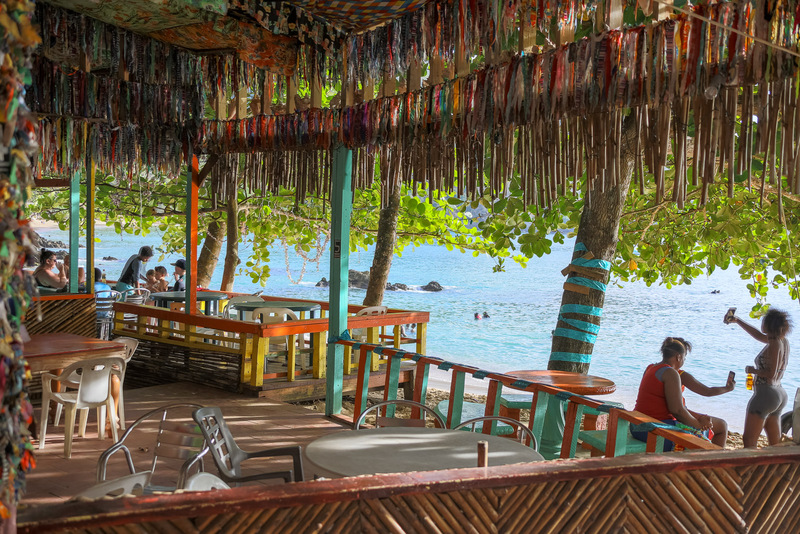 Bago's Beach Bar is small beach bar café-restaurant set in an idyllic beachside location at the foot of the Pigeon Point peninsula. 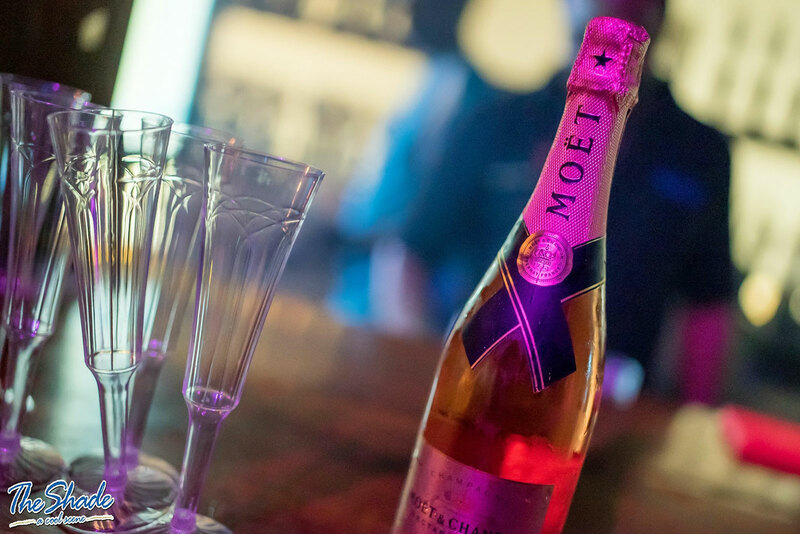 The bar is open from 11am to late, every day. 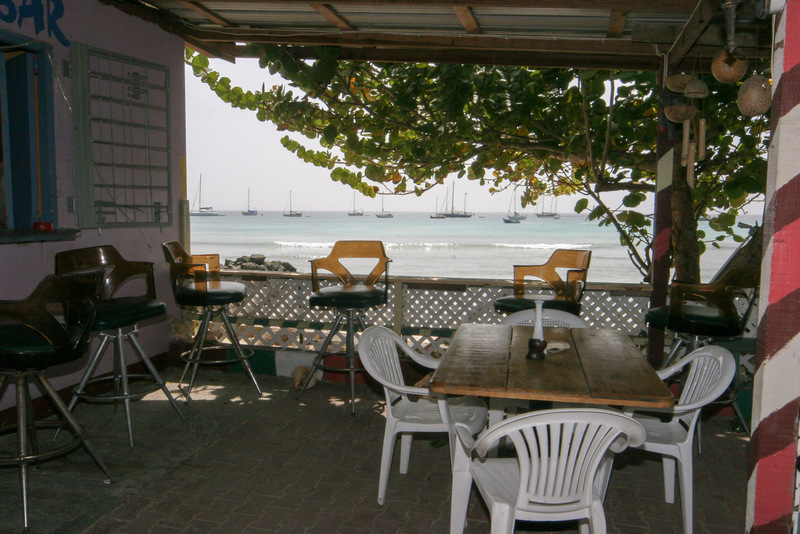 It is a popular place to enjoy a casual light meal and socialise with friends. 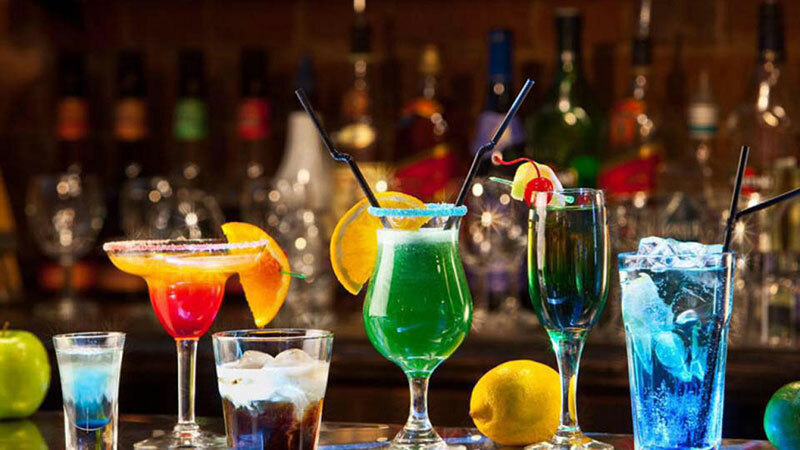 As such, it attracts a mixed crowd and it quite popular with the local business and expat community. The Overhang Lounge is a lively bar and restaurant located upstairs at Jimmy’s Holiday Resort in Crown Point’s strip. 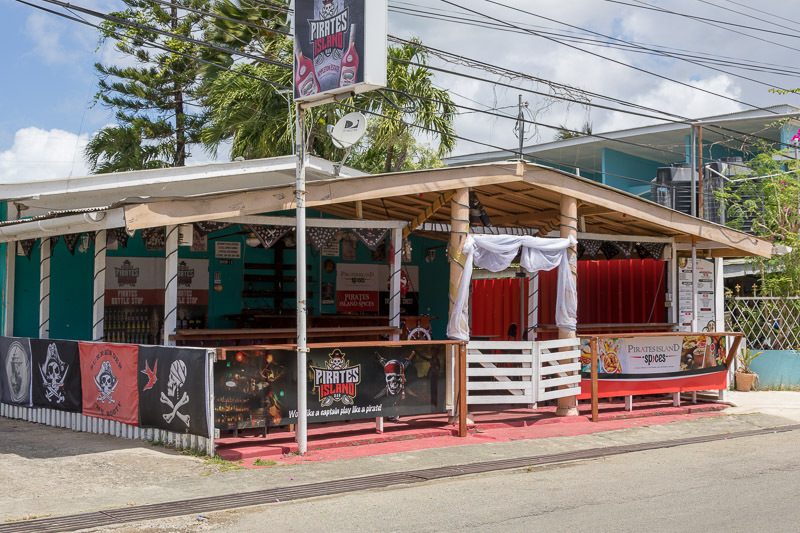 They serve lunch, dinner and drinks and have three large-screen TVs constantly tuned to the latest in sports and a wide range of music including soca, dancehall, hip hop, techno, and reggae. Pirates Island is located in the lower reaches of Pigeon Point Road, around 70m from the junction with the Milford Road. 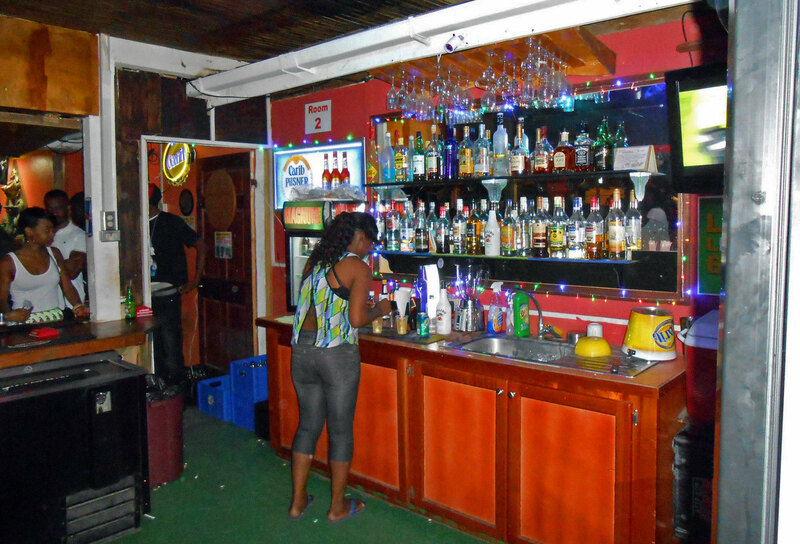 As a bar, it became a popular hang-out and meeting spot with the local business and ex-pat community. More recently, they have introduced catering, specialising in Indian dishes such as tandoori chicken and various curries. 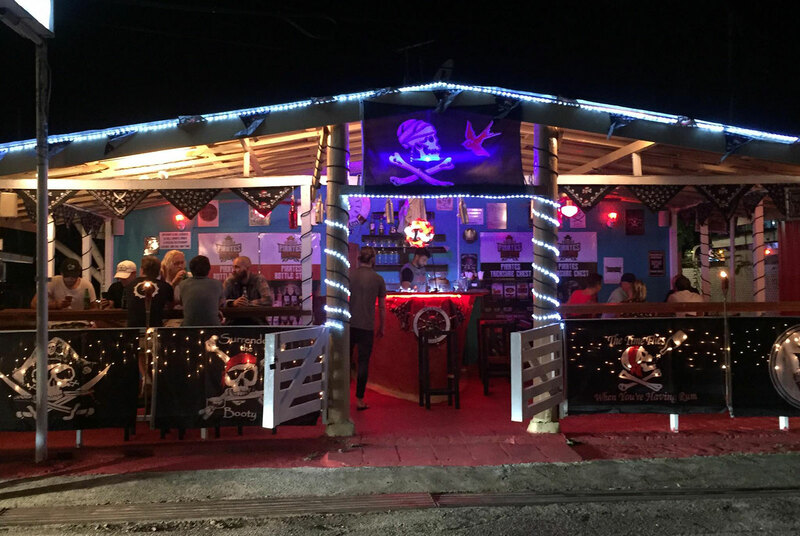 Illusions Outdoor Bar is located at the bottom of Pigeon Point, at the junction with the Milford Road. 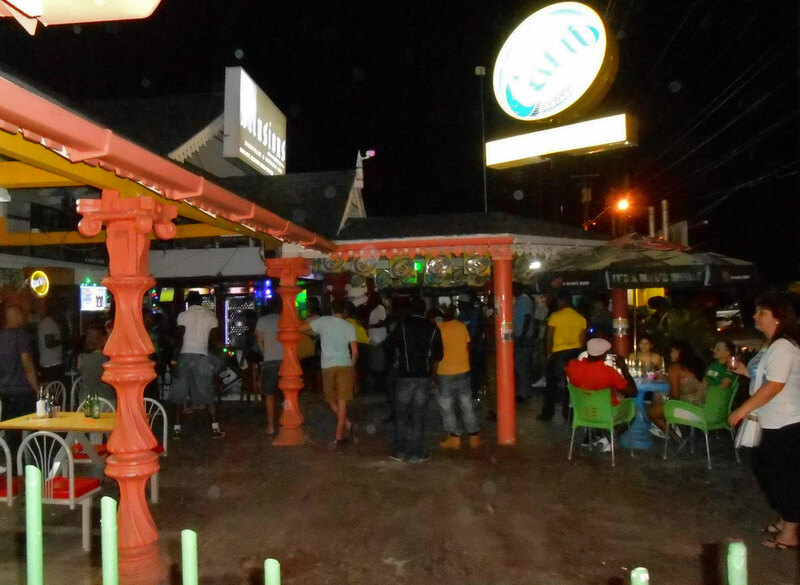 It is a very lively venue on Friday and Saturday nights. The Royalton Casino is a small gaming casino located at the Crown Point Beach Hotel in Crown Point. 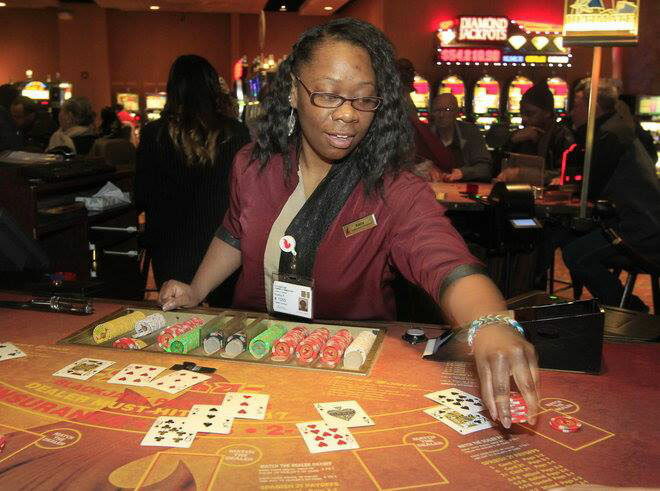 The casino offers table games and slot machines. 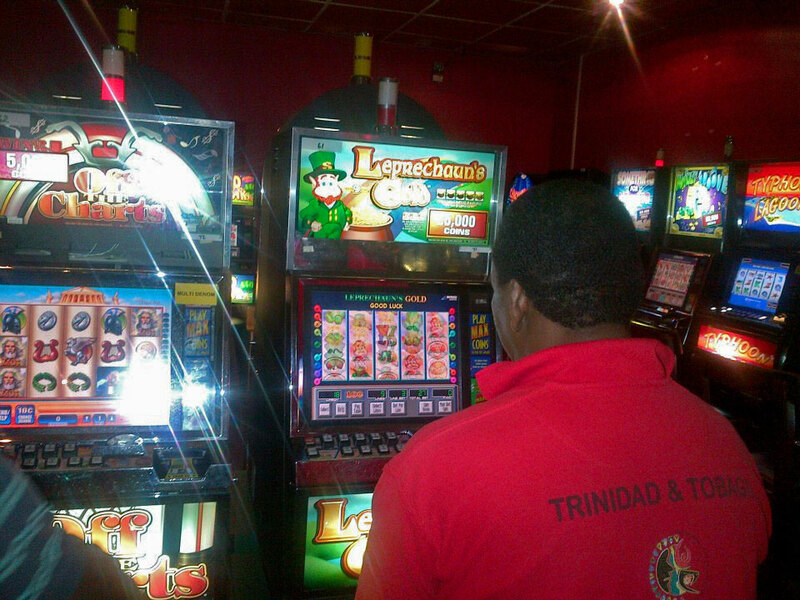 Visitors will be disappointed if they try to compare any of the Tobago casinos with their glitzy counterparts in many other countries. They are open from 8:30am to 4am. 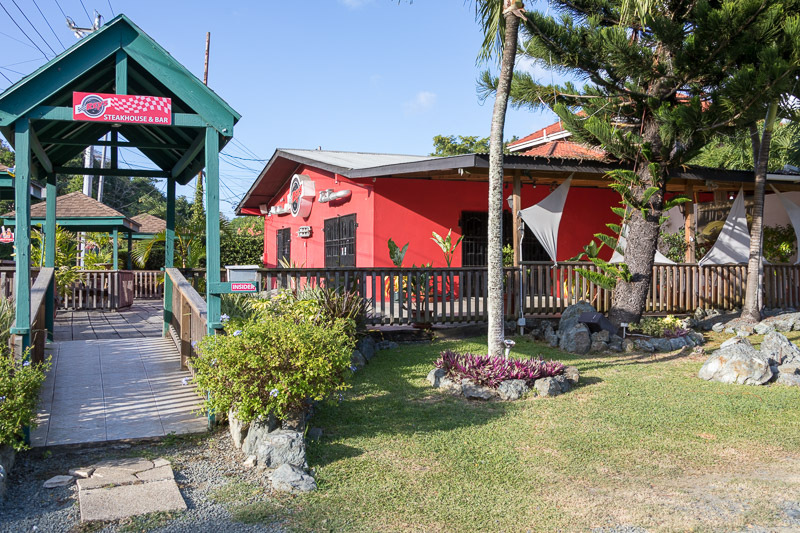 Previously located in the Fortune Plaza in Bon Accord, Jade Monkey has now moved to smart new premises in the centre of the Crown Point Strip. Jade Monkey is a casino, bar and grill. 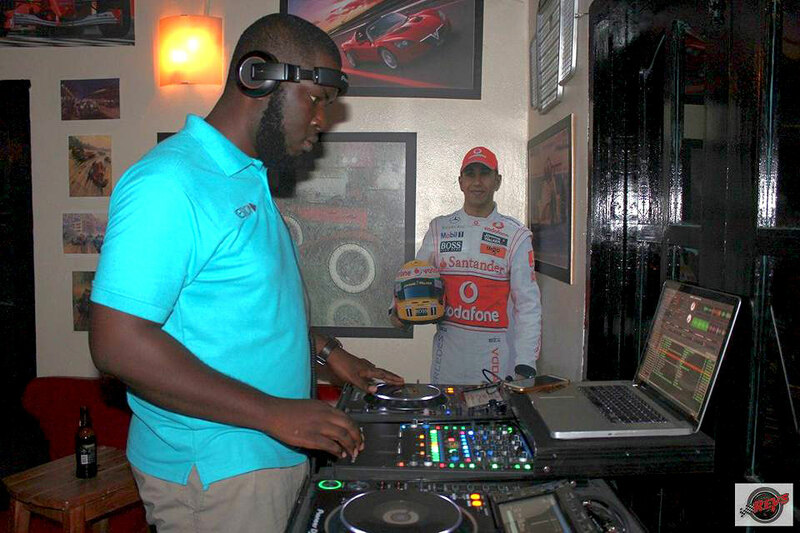 They offer slot-machines and other gaming amusements, with live DJs and a karaoke night on Wednesdays. 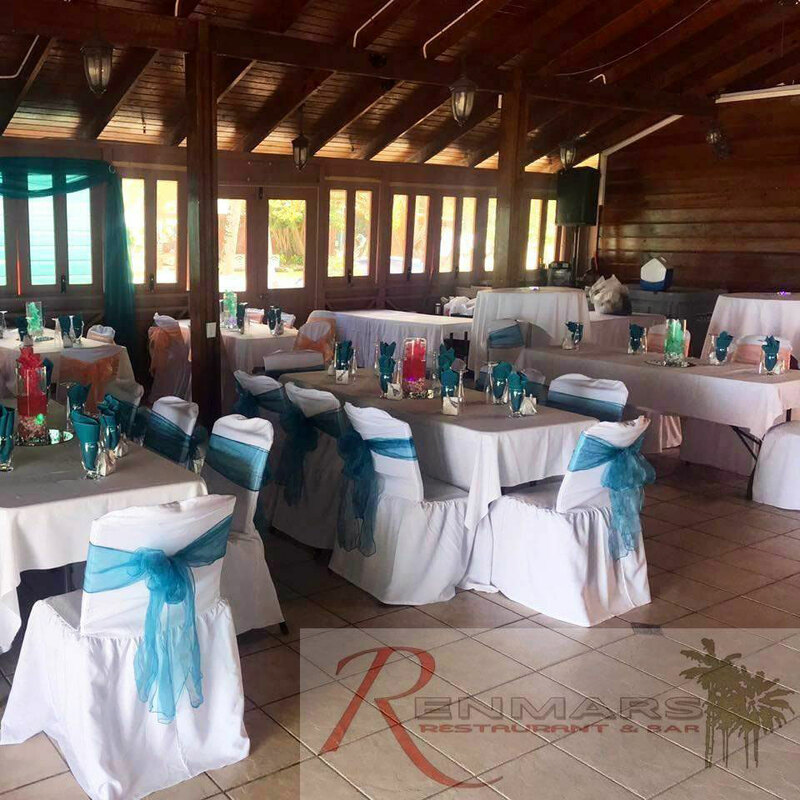 Located within the Pigeon Point Heritage Park, on the upper reaches of the peninsula, Renmar's Restaurant & Bar is a popular daily luncheon spot, specialising in buffet-style local cuisine. 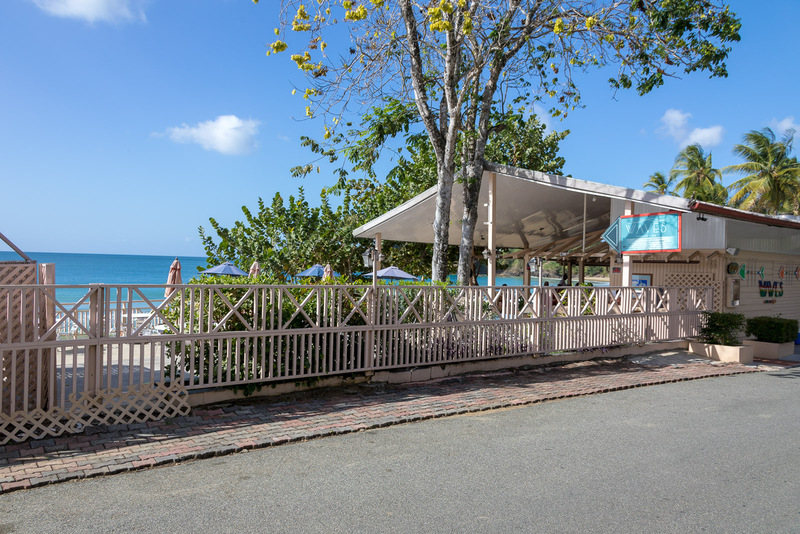 The beachfront bar area can become quite lively at times, making it a relatively popular spot to socialise. They are open from 10am to 7pm daily. Despite the name, there is nothing religious about this event. Sunday School is a loud, vibrant street party that takes place in Buccoo every Sunday evening and night. The event used to be held on the main street, but since the construction of the goat racing stadium, it has moved further up the street to Captain Sand Bar, home of the excellent Buccooneers steel orchestra, who put on a normally brilliant show from 9pm until around 11:30pm. 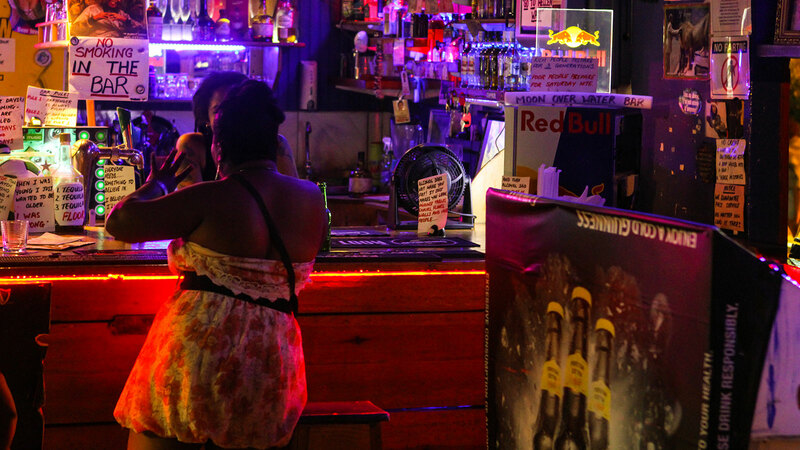 The younger locals tend to stay on and party from midnight until around 4am. Sunday School is a great place for people-watching. However, it is best to go with a knowledgeable local. 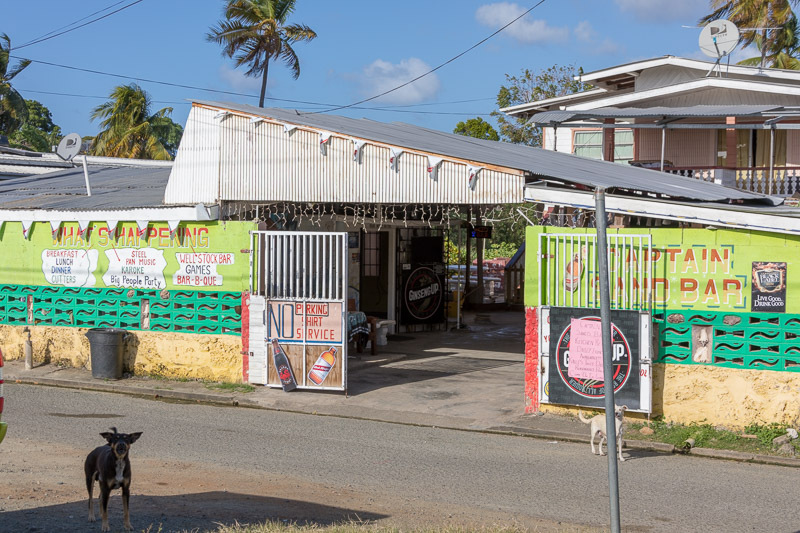 Apart from anything else, he will be able to get your food and drink at 'local' rates rather than the inflated 'tourist' rate charged by many vendors. If you go by taxi, arrange for the driver to pick you up at a specified time and place. 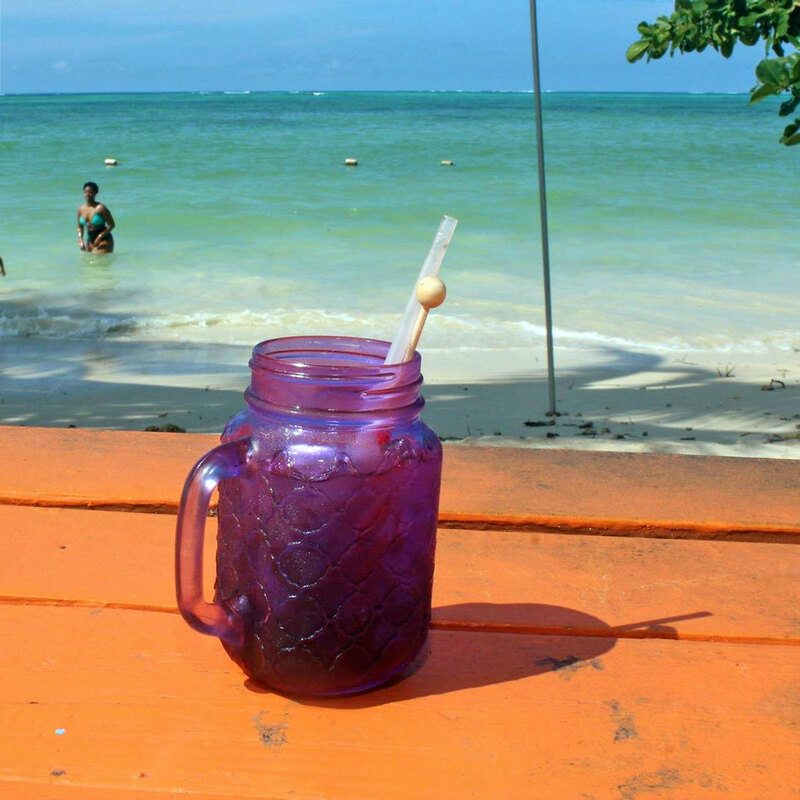 Do NOT take more than the few dollars (beer and rum are cheap and there's only a few barbecue and snack stalls) and leave all jewellery, expensive watches and cameras at your hotel. Like any crowded situation, the event can be a magnet for pickpockets. Sunday School is also a major 'pick-up' event, so don't be surprised if local gigolos make approaches to the ladies, even when accompanied by their partner. Rev's Steakhouse & Bar describe themselves as a “Themed bar serving signature cuts and cocktails”. 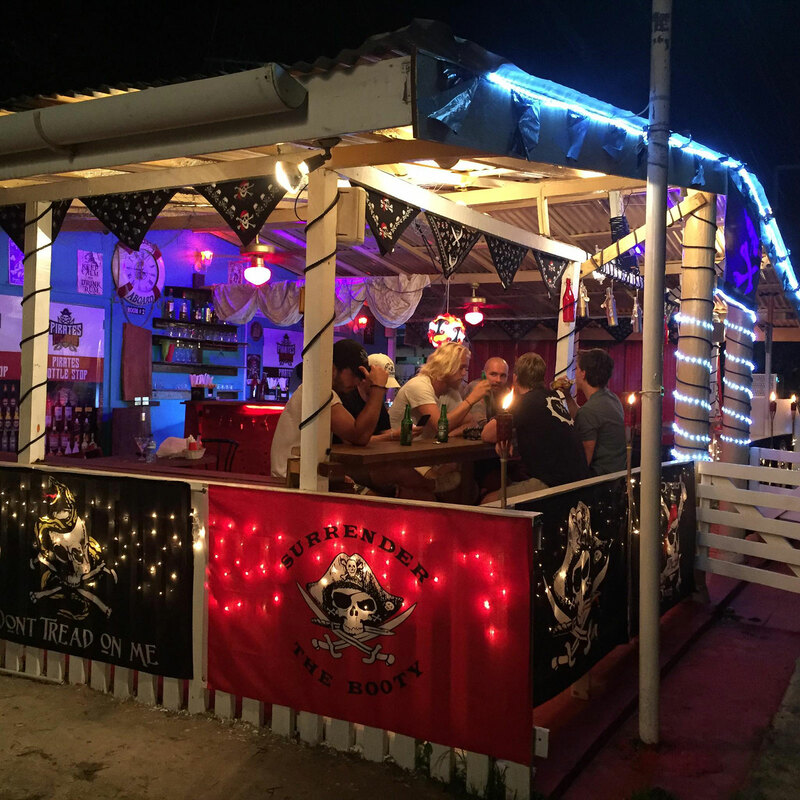 Opening times can be erratic during the week, but the bar has become a very popular social meeting point for the local expat and business community on Sunday evenings, when live music is often provided. 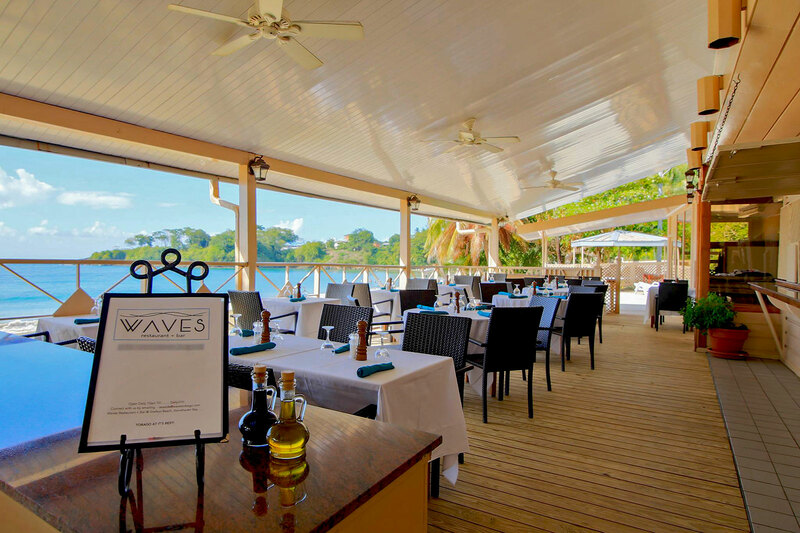 Waves Restaurant & Bar previously traded as Bucaneer’s Beach Bar. 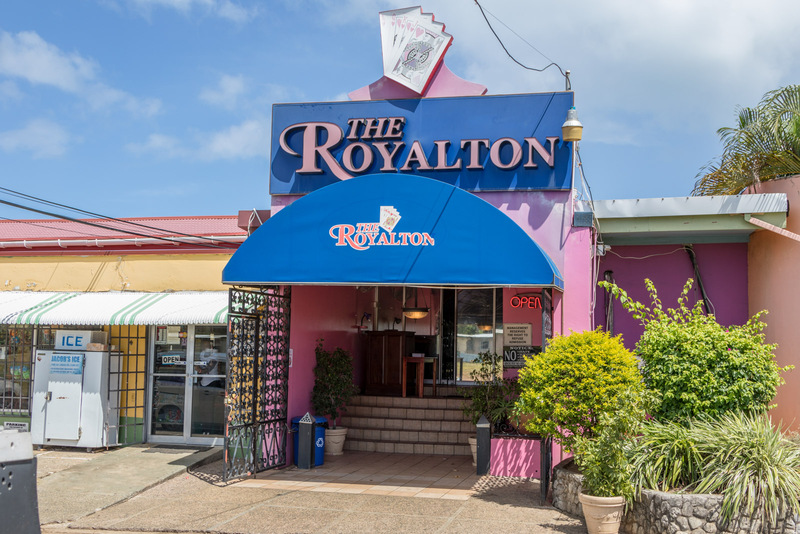 It is owned and managed by the adjacent Grafton Beach Resort and Le Grand Courlan hotels. 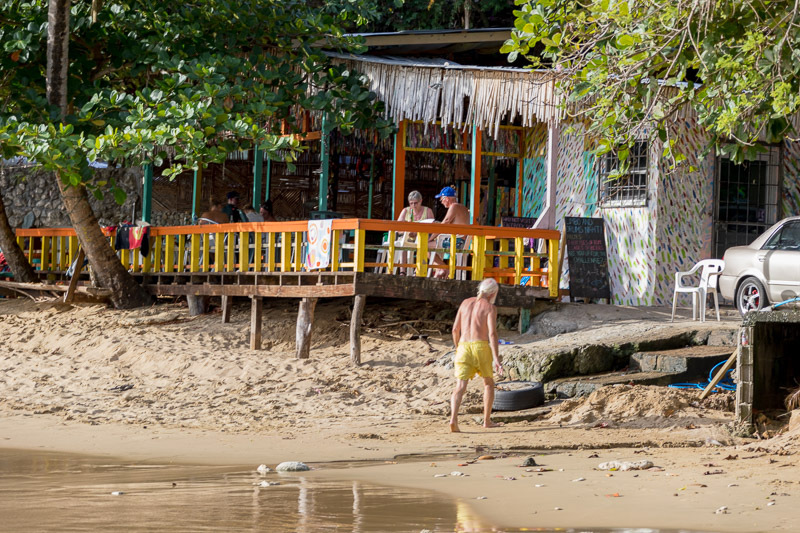 The bar and restaurant have possibly the most stunning location of any beach on Tobago, on beautiful Grafton Beach. Following a total refurbishment, the restaurant and bar deserve a visit. 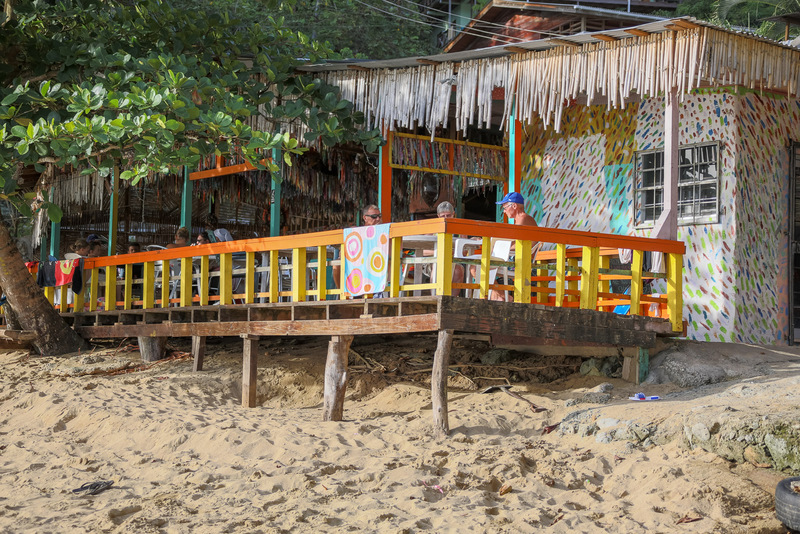 They are open from 10am to 11pm daily and serve lunch and dinners, with drinks and coffee at all times of the day. 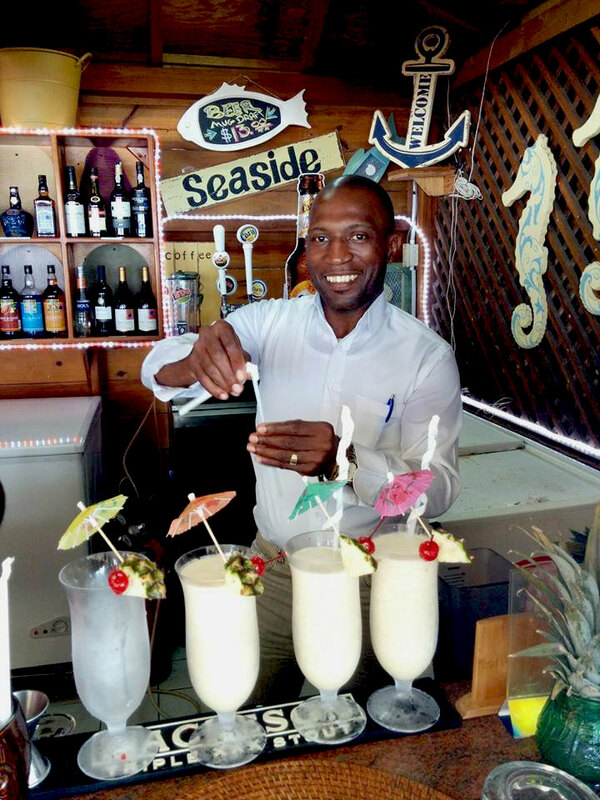 Happy Hour from 5-7pm has helped to make Waves a premier choice for those who wish to enjoy cocktails while watching the stunning sunsets over Stonehaven Bay and so it is not surprising that it has become a popular early-evening meeting place for expats and the local business community. 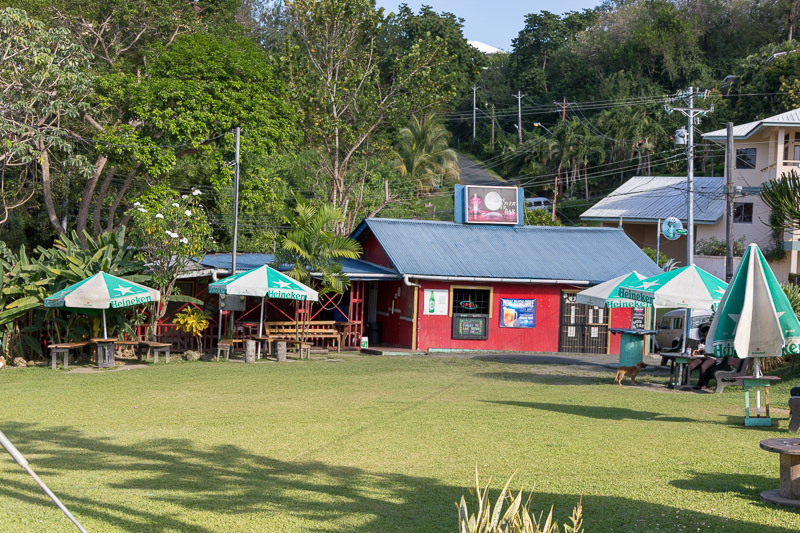 Cafe Down Low is a small local café conveniently located on the outskirts of Buccoo village. The cuisine is very much home-style local cooking. The café is open for lunch and dinner, plus coffee, snacks and drinks throughout the day. 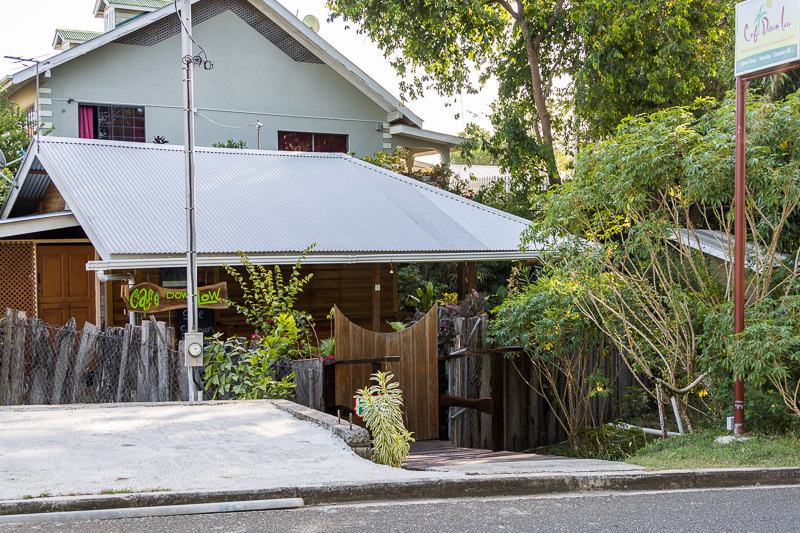 It has become a popular liming spot with the local business and expat community. 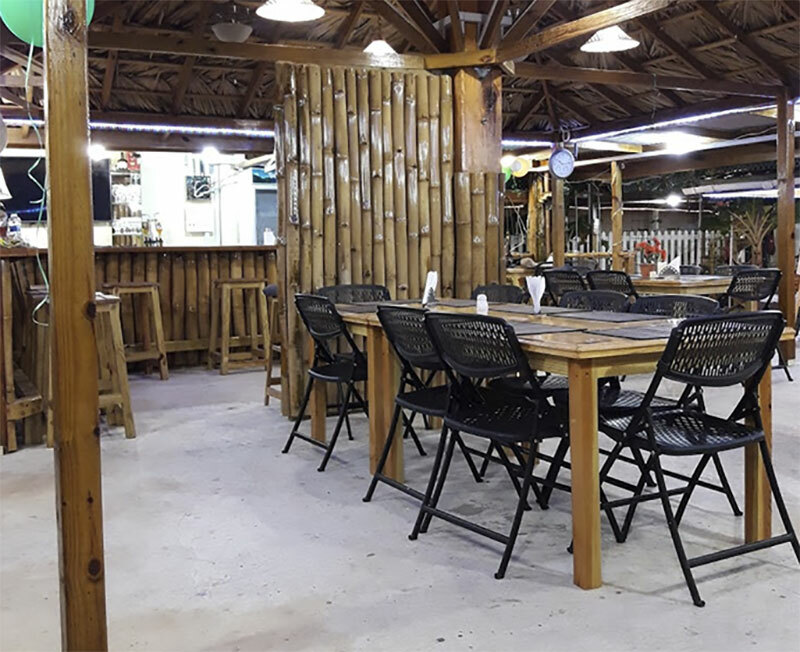 Bar Hop-in is a small ‘sports bar’ bar and grill set in an attractive garden setting just off the Shirvan Road in Mount Pleasant. Excellent ribs, jerk chicken and pulled pork. 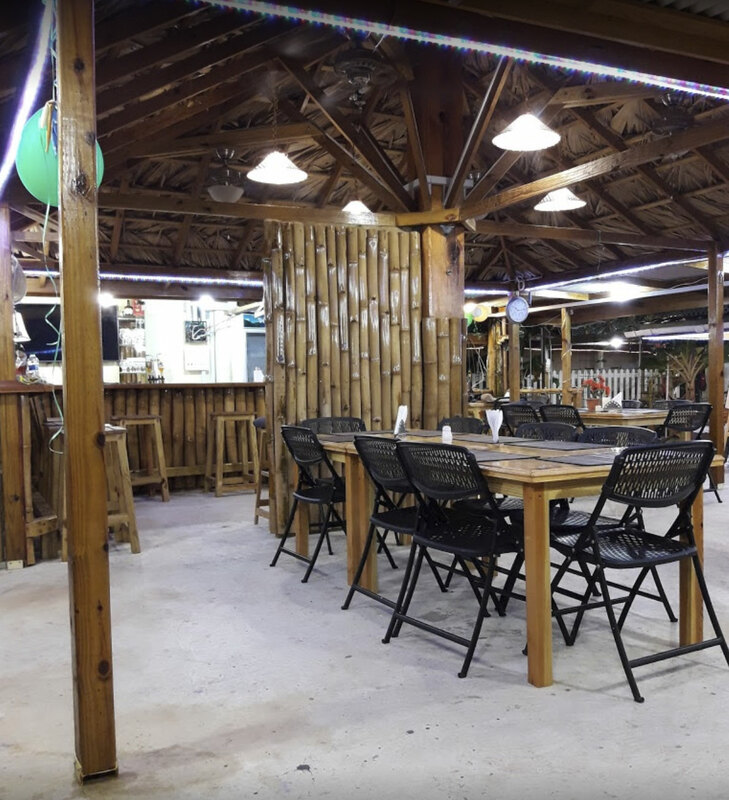 Often a very lively atmosphere with loud music, so not a place for a quiet or romantic dinner. Open Monday to Saturday from 4pm until late. 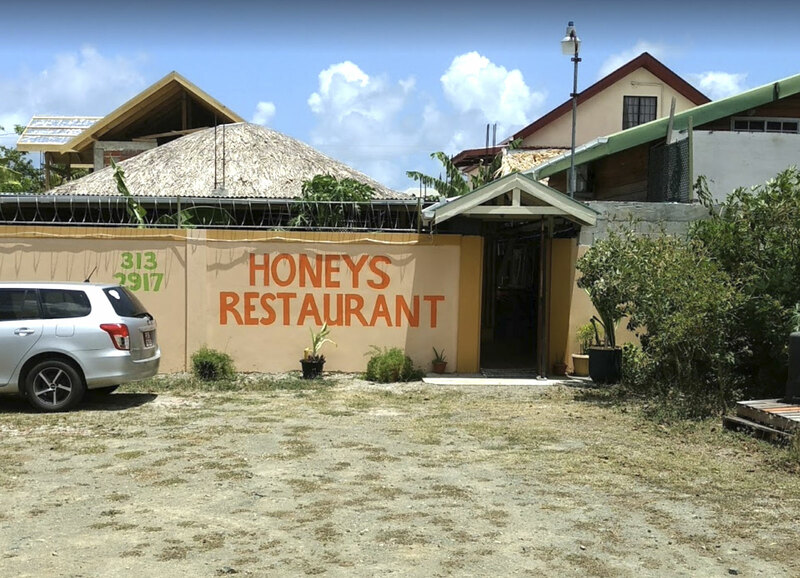 Honey’s Restaurant is a small local restaurant and bar located in the quiet suburbs of Mount Pleasant. Reports have been positive and it seems to be a popular place for the local business community to have a quiet drink and lime. 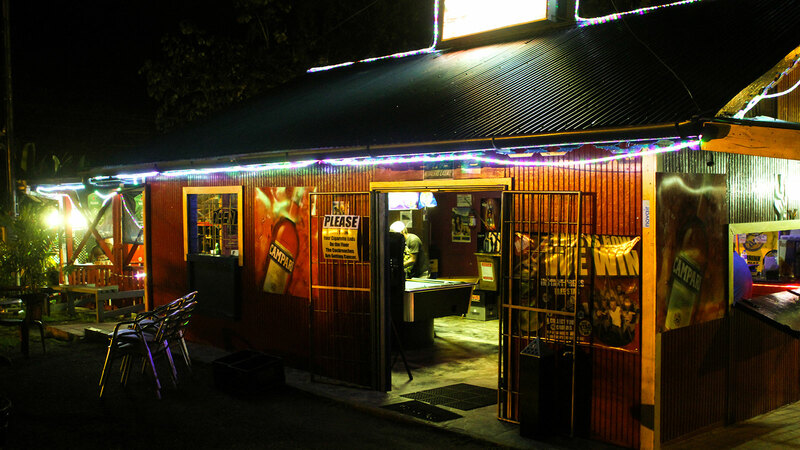 They are open Tuesday to Friday from 3pm-11pm (dinner from 7-10pm). Saturdays are 'Pork Day' with opening from 1pm-7pm. 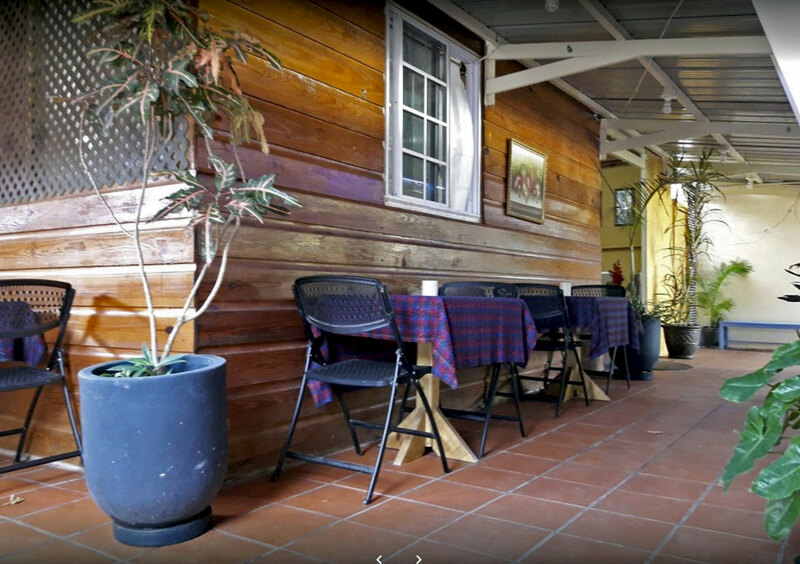 An 'English Roast' is served on Sundays, when they are open from 1pm-8pm (reservations required on Sunday). The Moon Over Water Bar is a lively bar located beside the playing field in the Pleasant Prospect ‘triangle’ near Grafton Beach. 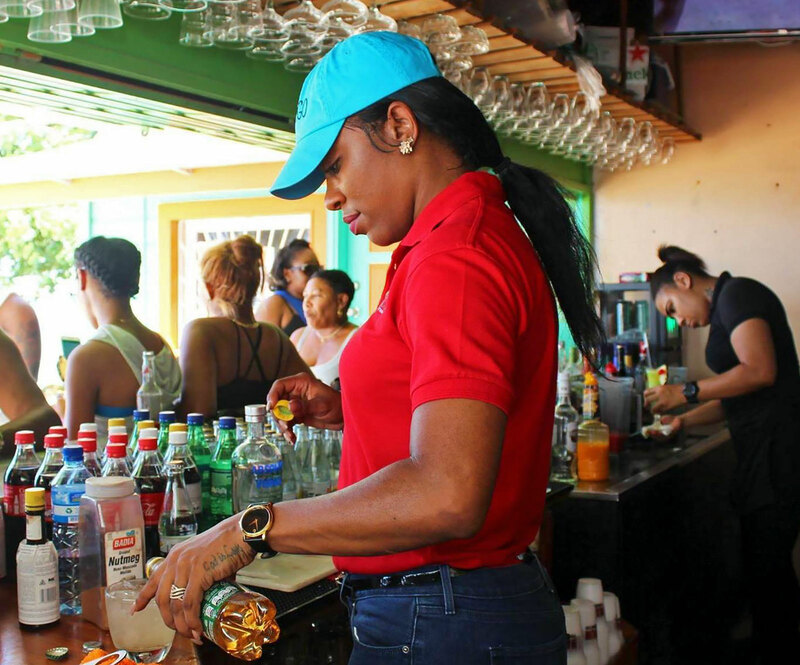 They claim to be a ‘sports bar’ with big-screen TV, pool tables, dart boards and video machines, but are probably far better known for the live DJs playing soca, reggae, dancehall, rap/hip-ho and house. Open all day, every day. 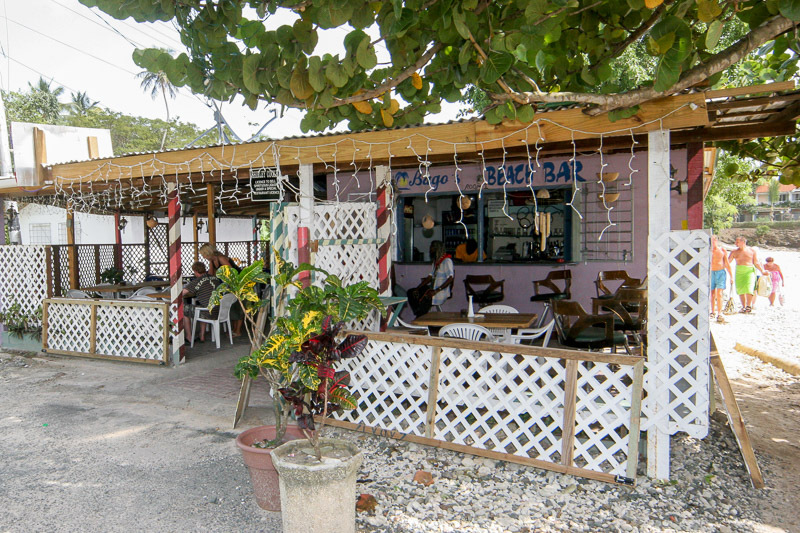 Legger’s Bar & Restaurant is a small and unpretentious local bar and grill at Pleasant Prospect. The location offers lovely views over Stonehaven Bay and the Caribbean Sea, making them a popular spot to relax and enjoy a beer or drink while socialising with friends. 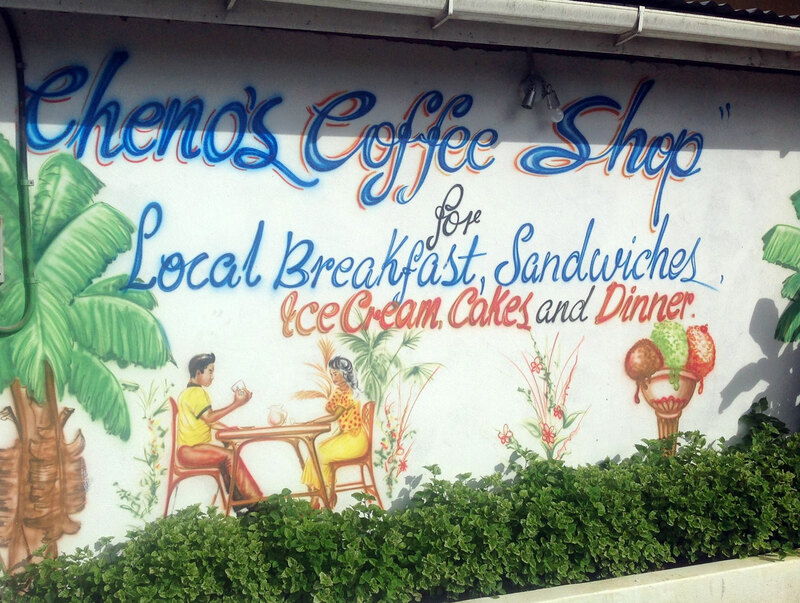 They are open for breakfast, lunch and dinner from 6am to 10pm, daily and also offer a takeaway service. 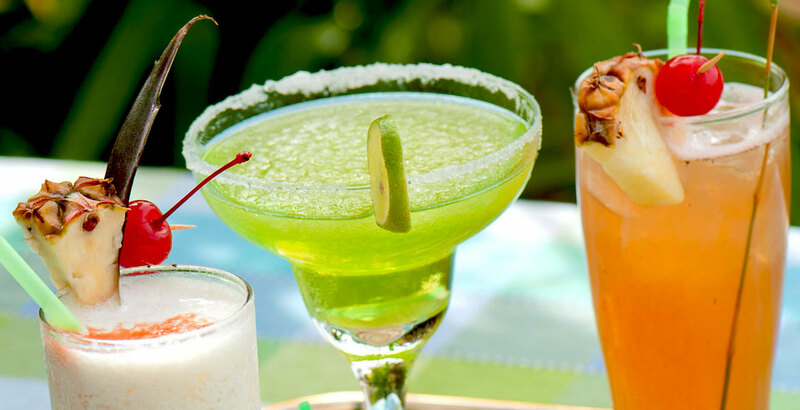 Sunset Palm is a private member's club offering roulette, blackjack, rhum 32, 3 card poker and slot machines. 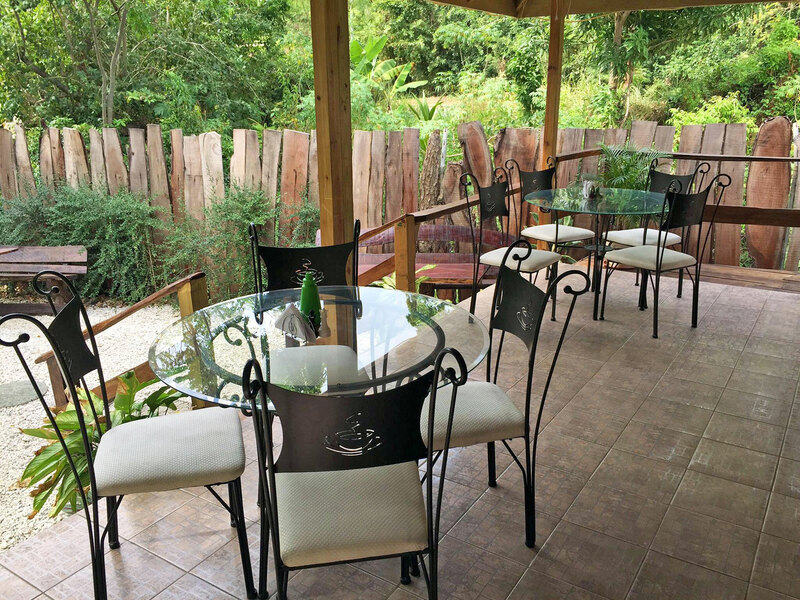 It is located in the grounds of Tobago Island Suites at Buccoo Junction. 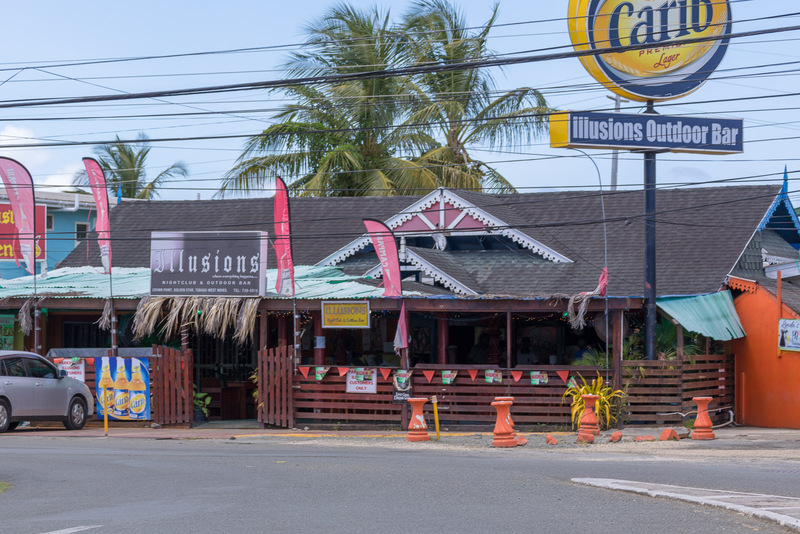 Castara’s Coffee Shop, or Cheno's as it is often more commonly known, has become something of a local institution in recent years and is unquestionably THE place for holidaymakers to enjoy breakfast, lunch or a light dinner. 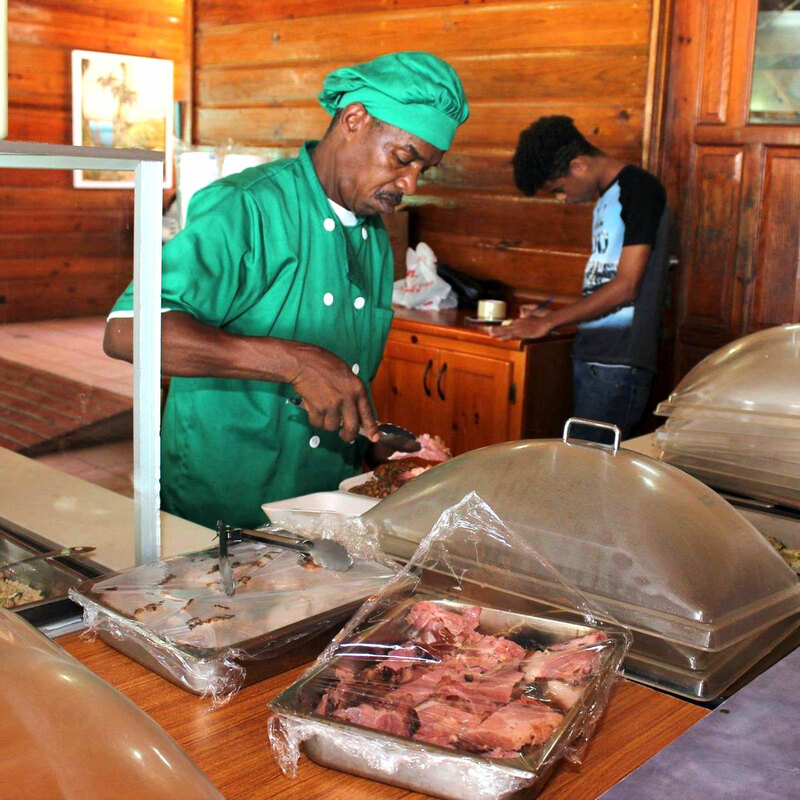 The catering is relatively modest, but the service is undoubtedly the warmest and friendliest in the village. 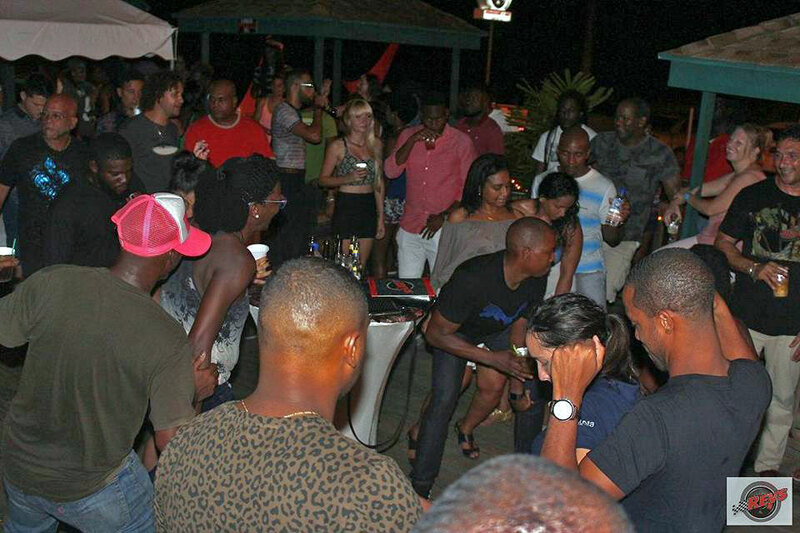 Saturday evenings are the highlight of the week, as Cheno lays on a barbeque and solo steel pan player. Quite a party atmosphere invariably follows. 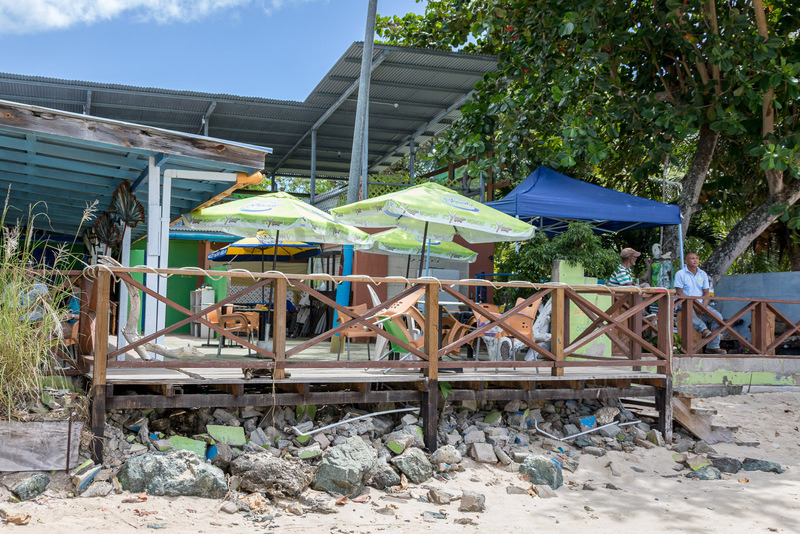 Located beside the gorgeous Little ‘Heavenly’ Bay beach, the prettier and more popular of Castara’s two beautiful beaches, it is hardly surprising that the Boathouse Restaurant & Bar is a popular venue with visitors to Castara. 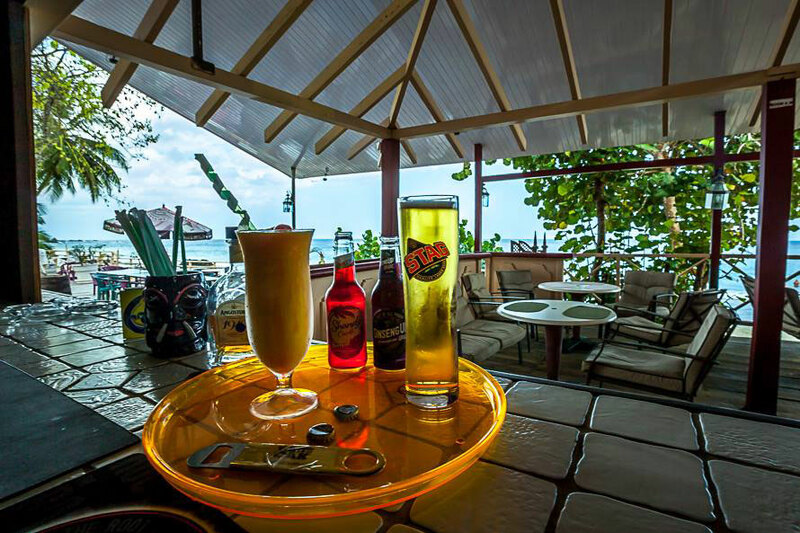 The restaurant and bar is open for lunch and dinner every day except Saturday and you couldn’t find a nicer location to enjoy a cold beer or cocktail at any time of day, while enjoying the stunning views across the bay. The home-made pizzas available on Sundays are a particularly favourite, whether eaten in or taken out. Wednesday evenings are hugely popular at the Boathouse with both locals and visitors alike. 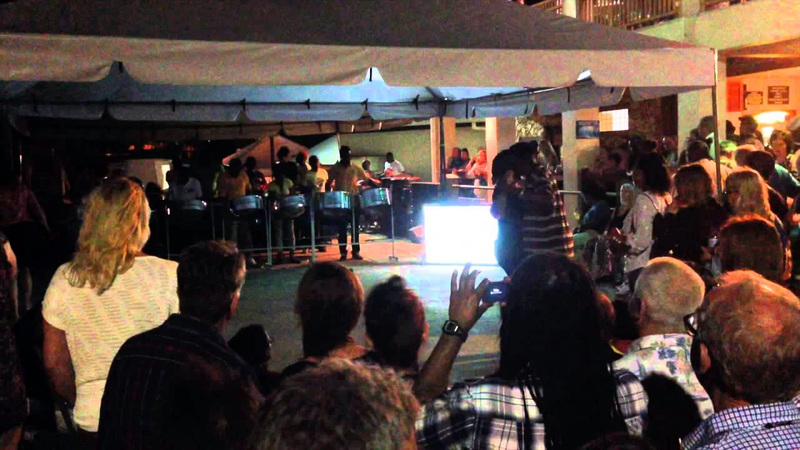 Owner, Brenton Taylor, takes the lead in a local drum band. 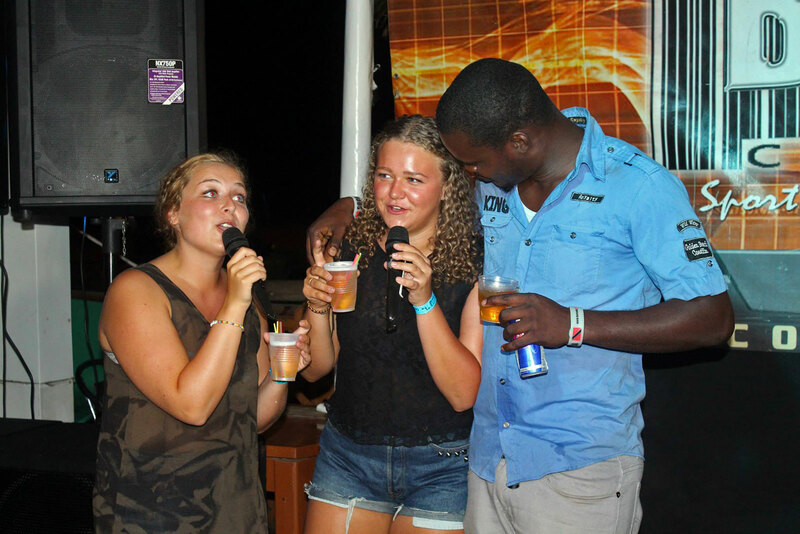 When the audience get involved, the evenings can turn quite lively. Given its stunning location right on the main beach, Cascreole should be a goldmine, but whilst the owner’s wife Debbie is undoubtedly capable of some excellent local-style cooking, the performance of this business has been erratic, to say the least and one is never sure whether it will be open or closed. As a result, people tend to make alternative arrangements and if you do go, and it is open, chances are that you might be the only patrons. Having said that, Thursday evenings at Cascreole have become part of the local scene. There is a big bonfire and barbeque with a DJ with questionable taste in music. 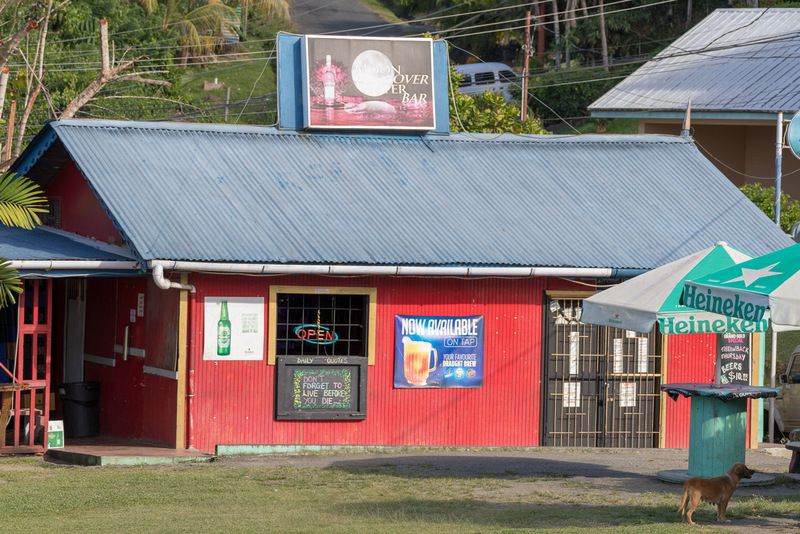 Glasgow’s Bar in Parlatuvier is hard to miss and offers one of the most spectacular panoramic views in Tobago. 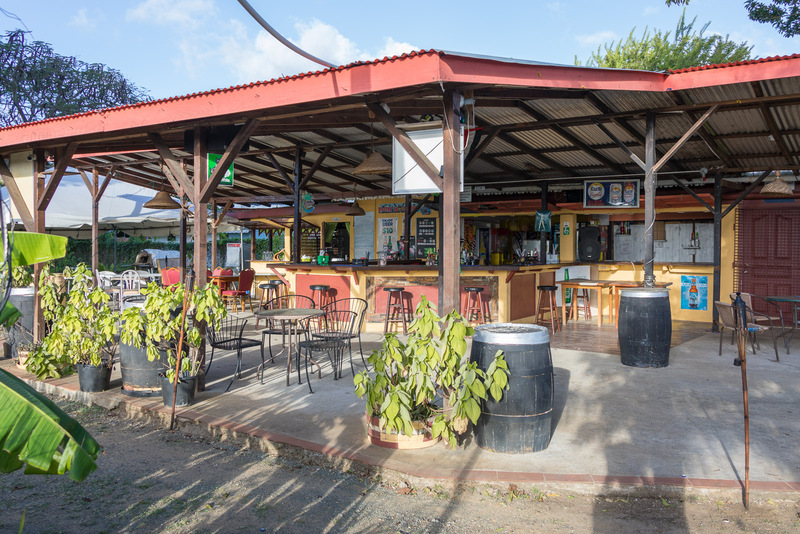 Located high on the hill before the road drops down and into the village, the bar is immediately adjacent to a wide parking and viewing area on the Castara/Englishman’s Bay side of Parlatuvier. 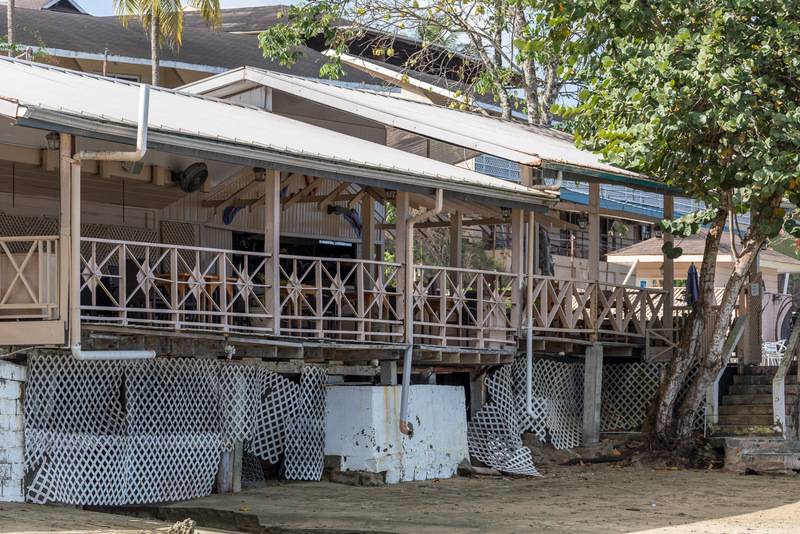 The bar has two levels, both offering the most stunning views of Parlatuvier Bay, beach, village and surrounding rainforest-clad hills. 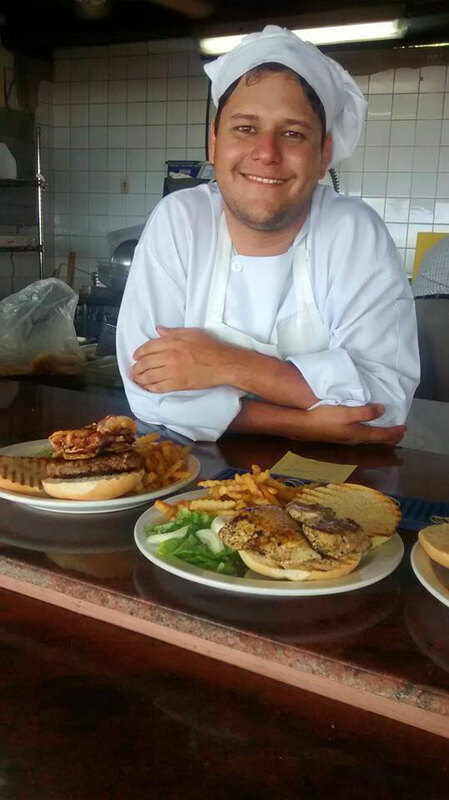 Light snacks are often available, and service is friendly. 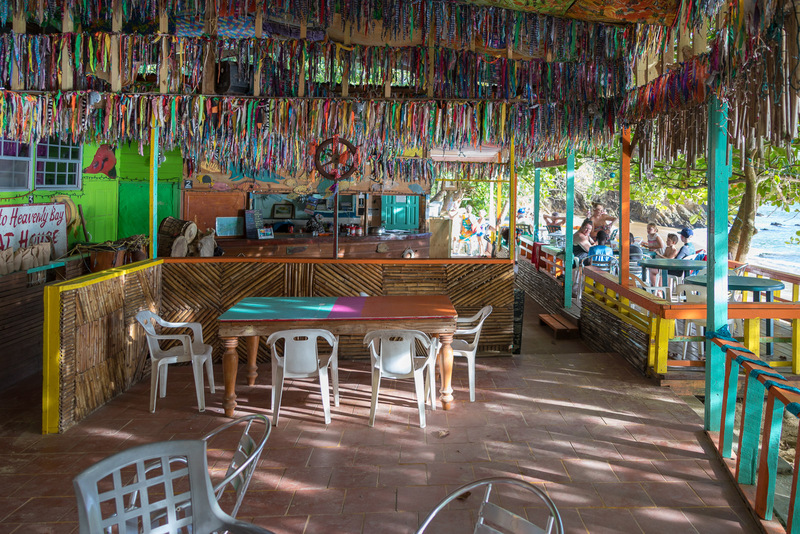 The bar is a popular meeting point for visitors staying in the area. 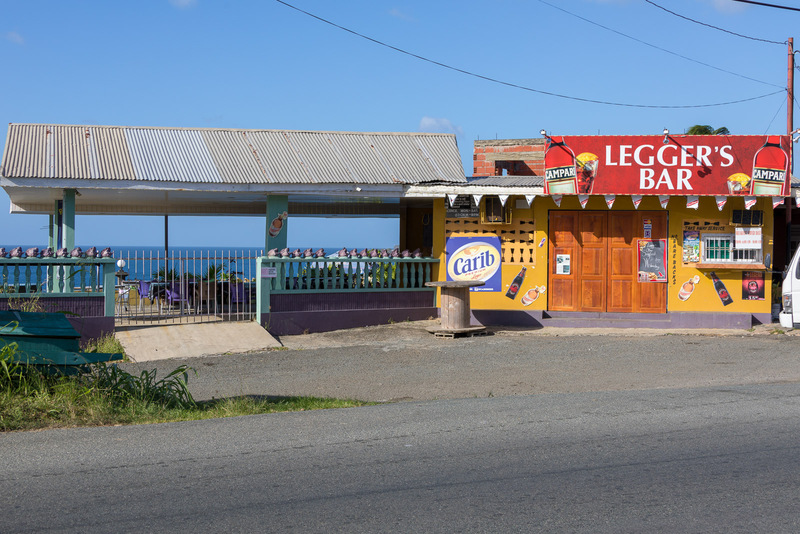 We are not aware of any nightspots or entertainments along this stretch of Tobago coast. 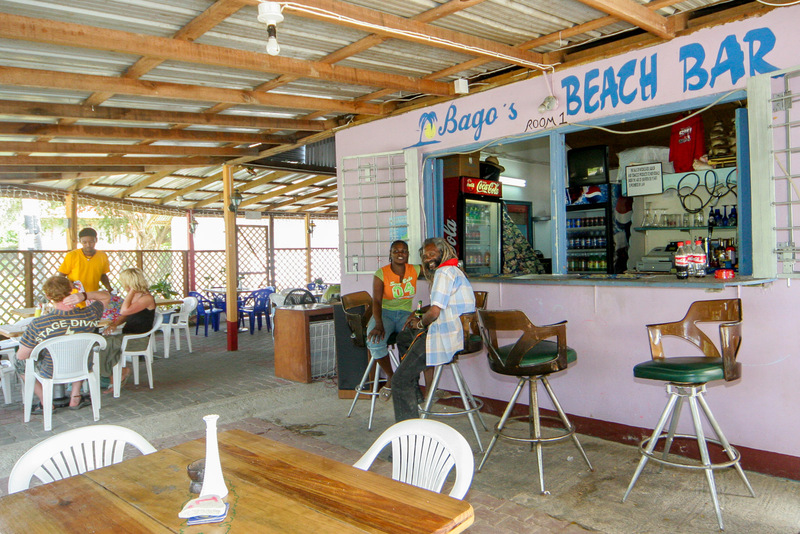 We are not aware of any nightspots or entertainments along this stretch of Tobgo coast. Located a short distance from the Scarborough harbour and port, on the Milford Road, this sports bar features large-screen cable/satellite sporting channels. 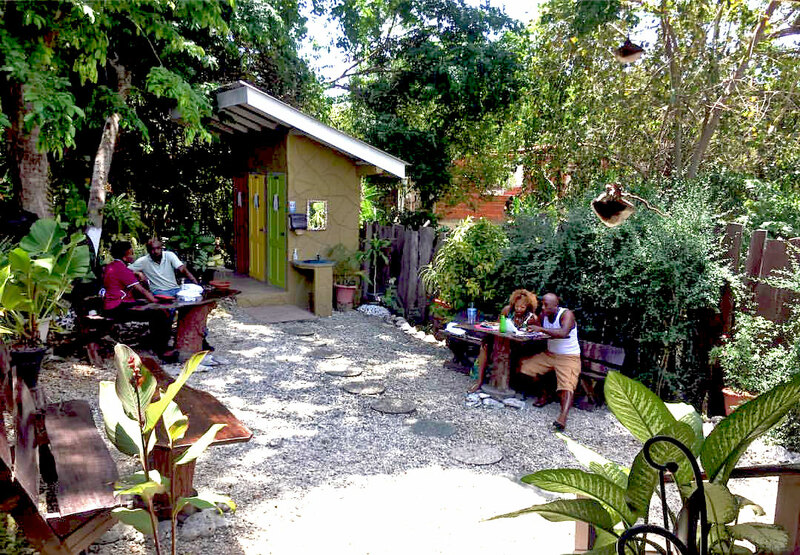 They serve lunch, dinner and snacks, but are not what most would describe as a restaurant. 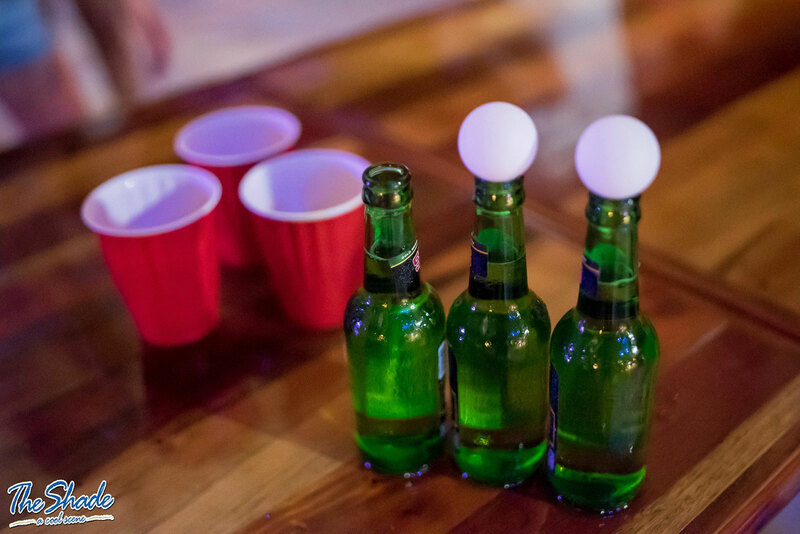 There are pool tables and the atmosphere can be lively. 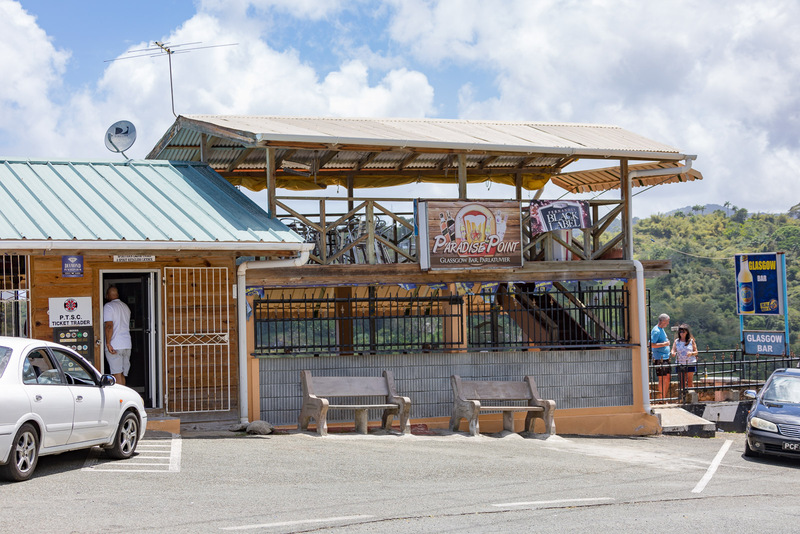 Customers are mainly local but it has always been popular with visitors dedicated to their sport. Open Tuesday to Sunday, 11am to 2am.